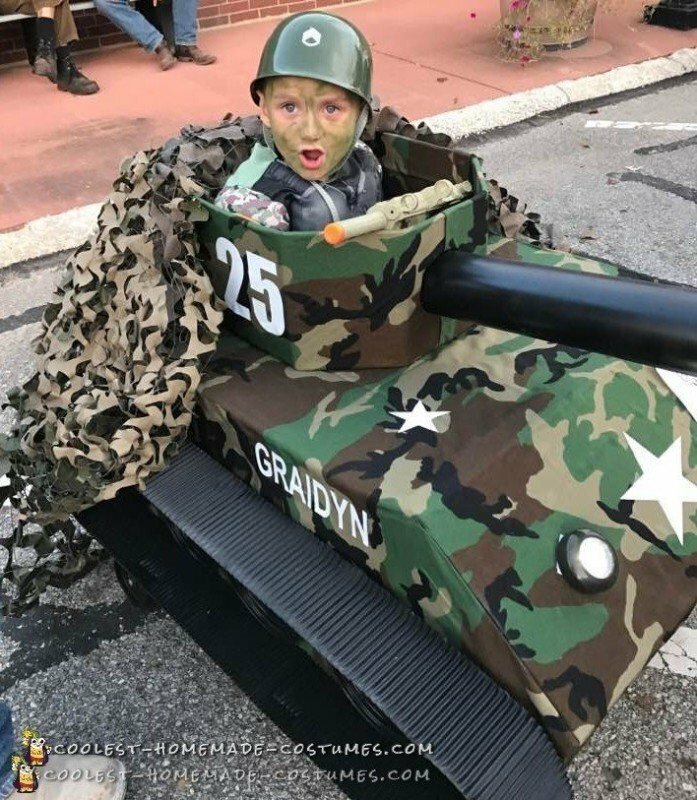 When your son’s dream is to have an army tank costume, you get to work. After I completely scraped two tank tries, I got it right with this one! I utilized a 5 by 3 foot industrial cardboard, a lot of Gorilla Glue, Gorilla Tape, and spray adhesive in order to get the camouflage fabric to stick. To create the rails, I ordered corrugated paper and painted it all black. To make realistic headlights, we used LED lights. For the cannon we got battery operated flashing LED lights. We needed real army tank costume sounds. So I purchased a toy tank and took the sound piece out (along with the battery and switch). I stuck it inside the end of cannon and it sounded great! My son dressed in a camouflage outfit that we found at Target in the dress up section. I used green face paint on his face and topped it off with a cheap Army hat from WalMart. 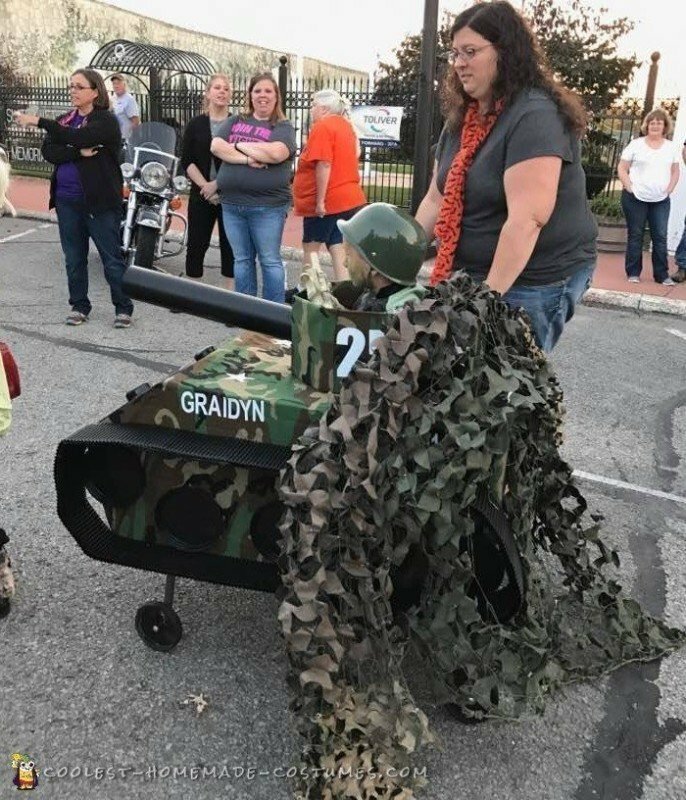 This Army Tank costume ended up being too heavy for him to carry. We used 4 PVC pipes, drilled them into the bottom and bolted them in. Then we removed the training wheels off of two bicycles and bolted them on so that the costume could roll. I also used some of the camouflage fabric to make two handles (and, glued them with gorilla glue) on the inside so that he could use them to help roll. In the end, there were no problems with the tank rolling. 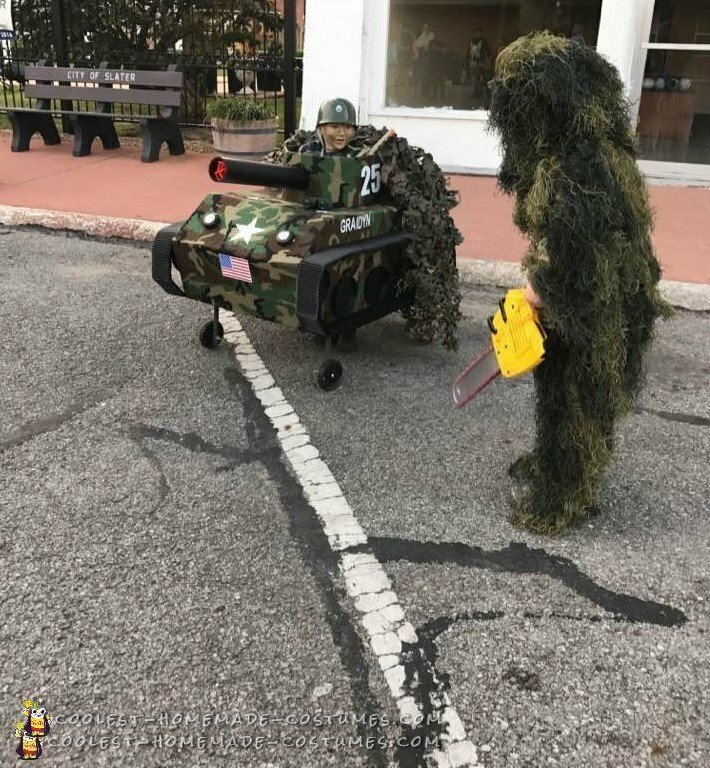 My son did not need to use the handles at all as his army tank costume rolled easily on the street, sidewalk and grass. The costume turned out a lot sturdier than I thought, and I am sure that he will get tons of use playing with it in the next year, before we start on the one for next year. This one won two Costume Contests and seemed to be a hit with everyone. One contest was local and one was at an event in Kansas City.